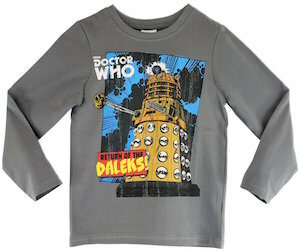 If you child love Doctor Who and needs a long sleeve shirt then look no further as this will make them happy. The grey long sleeve top comes in sizes 7 – 14 and is made from 100% cotton. On the long sleeve t-shirt you can see a big image of a yellow Dalek and the text “Return Of The Daleks!” and also the Doctor Who logo. Now adults will be jealous as this boys shirt is just amazing looking and it could become your child’s favorite really quickly. This Dalek shirt is an officially licensed product and that only makes it even better. This kids umbrella is what every little Doctor Who fan wants. 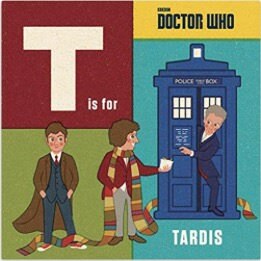 The umbrella has black panels and panels that are blue with on it the Tardis and the 11th Doctor with his Sonic Screwdriver and even the Doctor Who logo. 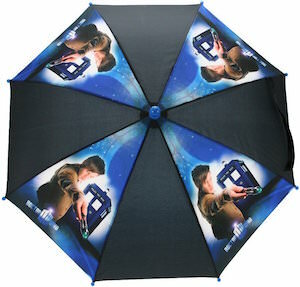 Owning a special Doctor Who umbrella like this is something every true fan wants. Now the kids will just wish it starts to rain so that they can play with their umbrella and even on a hot sunny day you can use it to block the sun and create some shade. No more rain in the life of a Doctor Who fan when you own this Doctor Who The 11th Doctor And The Tardis Kids Umbrella.